Since his first comic was released in May 1962, The Incredible Hulk is one of the most iconic characters to have come from the imagination of veteran comic writer Stan Lee. From his initial comic fame came a successful TV series throughout the 70s and 80s, and he has appeared in three of Marvel’s recent wave of films, the first of which came out ten years ago in 2003. Of these three, two are stand alone films for the character, and only two officially take place in the canon of Marvel’s Cinematic Universe. Each of the three films has different stars, directors, and styles, but they also relate to each other in the form of a varied beginning, middle, and end of the same story. Much like Bruce Banner himself, the films are each different, but inseparable from their alter egos, as a detailed look will reveal. ‘Hulk’ was the beginning of Marvel Studio’s fifth comic book adaptation franchise, after Blade, X-Men, Spider-Man and Daredevil. First up was the film simply titled Hulk. No ‘Incredible’, and not even a ‘The’, Hulk was directed by Ang Lee, someone noted for character driven films which explore certain themes and ideas, The Ice Storm being a prime example, and so bringing a big green monster to the screen was something of a surprise add to his resume. The result however was a film which combines the nods to classical literature of the likes of not just Dr. Jekyll but also Beauty and the Beast, with comic book action that could only have come from the director of both Sense and Sensibility and Crouching Tiger Hidden Dragon. 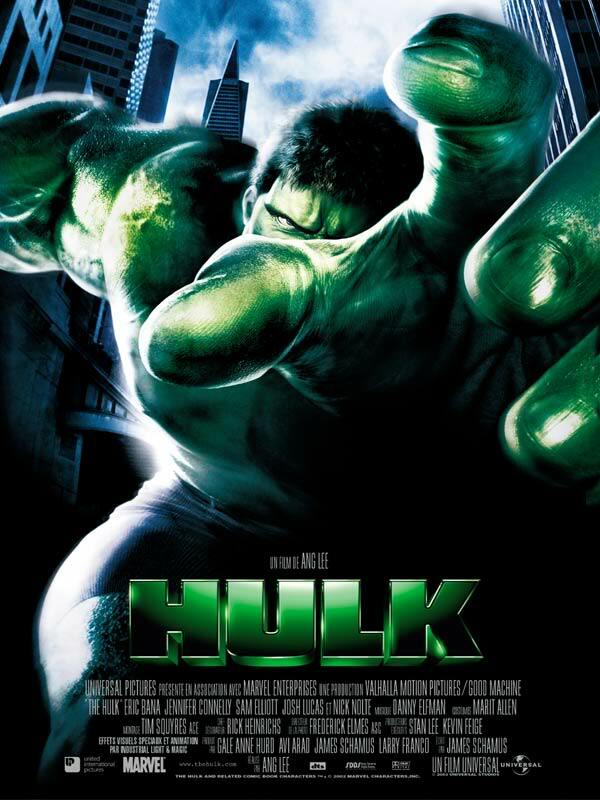 Whilst keeping the themes and inspirations intact, the film does play with the original comic’s story somewhat, particularly in terms of Bruce Banner’s transformation. Although still getting his gamma infusion by sacrificing himself in front of an invention of his own making, this time his dose of gamma radiation comes from a medical experiment designed to heal wounded tissue. 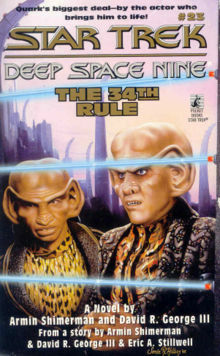 Something which is also combined with genetic mutations passed on from experiments that his father David (a nod to the TV series), tried on himself. The film does include a desert explosion with tenuous links however, again caused by his father, and which occurs as a young Bruce witnesses his mothers accidental death by his father’s hands, when she falls in front of the knife aimed at her son. Thus the psychological trauma of Bruce Banner is born. While it may have changed the story of the comics a little too much (although you can see why they didn’t risk a hero who builds nuclear bombs just two years after 9/11) this first big screen adaptation unfortunately goes the other way in terms of the medium itself. Lee’s choice of split screen editing is an interesting addition which certainly has its moments that shine, but like the use of slow motion in The Matrix sequels, becomes overused far too quickly. In addition, the fight between Hulk and a mutated poodle, as well as with his father’s own rather curious transformation are perhaps something that should have been left between the pages of an actual comic book. Over the top they may be, but it has to be said that for a ten-year old film, the CGI is still able to stand on its own feet, and in fact the only thing that risks dating it is the youthful Eric Bana in his first starring Hollywood role. This is not the only instance of an actor standing out however, as they, along with their characters, are its success. Bana brings out both the vulnerable and enraged sides of Bruce Banner with ease, and Jennifer Connelly unsurprisingly brings a great performance to the role of Betty Ross, having come straight from her applauded roles in Requiem for a Dream and her Oscar-winning performance from A Beautiful Mind. Receiving mixed reviews from critics, it is a film in which its failures come only from trying to hard. On the reverse of this however, the film also strives to make new ground, Betty’s scream of calling General Ross “Dad” being a prime example as it seems almost as though it’s meant to be a revelation, but no new ground is really ever made. In addition to this, Banner’s background as a brilliant scientist is hardly mentioned, and where the audience doesn’t have prior knowledge for the film to fall back on, it would seem he is merely a military pawn that just happens to be good with machinery. In terms of the retcon, Banner’s transformations now come courtesy of a decades old super soldier serum, a nod to Captain America for those in the know, but for those who aren’t it may seem a possibly unneeded change that still keeps the lab experiment at the expense of the characters established origins. In addition, the fact that the military never told Banner what it was exactly just adds even more to his scapegoat like status. While Tim Roth may be a great choice to play the newly introduced Emil Blonsky, his desire for, and transformation caused by the Hulk’s power is merely a better realised version of Banner Snr’s story. The fact that he is a power hungry soldier also only adds to the Hollywood cliche, and is a perfect example of the film as a whole, there just doesn’t seem to be enough originality on offer. Unfortunately, the films pitfalls don’t end here either.The attempted humour just feels too forced throughout (“You wouldn’t like me when I’m hungry”? ), and the cast don’t really live up to their predecessors, although it has to be said that they did leave the bar rather high. The core trio of Edward Norton, Liv Tyler and William Hurt are all fine actors in their own right, but the script (which Norton also had a hand in) just doesn’t seem to let them flex enough of their acting muscles. Unlike Sam Elliot’s, Hurt’s General Ross in particular hardly seems like the type to earn the nickname ‘Thunderbolt’. 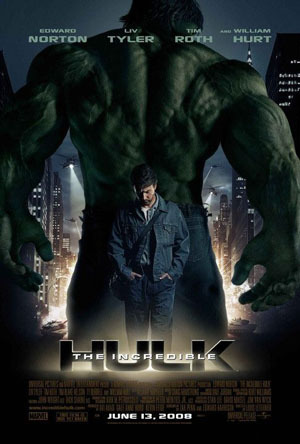 That said, The Increible Hulk is not a bad film altogether, it just doesn’t have much to work with. What it does have however, it uses to it’s best, and the Hulk Vs Abomination showdown is something to behold. It may not have the joy of destroying US military hardware via a gold medal hammer throw, but with the flailingly gruesome deaths handed out to soldiers and civilians alike, it’s fair to say that The Incredible Hulk was aiming at a tone more dark than entertaining. Something which it also makes the most of; the first ‘appearance’ of Hulk amongst the industrial bottle plant’s shadows does bring out the the best of an Alien influenced ‘less is more’ atmosphere. All in all it seems that the films main function is merely to act as a bridge, essentially nothing more than preparing Hulk‘s audience for the eventual release of (The) Avengers (Assemble) some four years later; it is the simple narrative purpose of Banner getting on the right side of the military (alongside an obligatory Downey jr cameo), in the guise of a cinematic blockbuster. 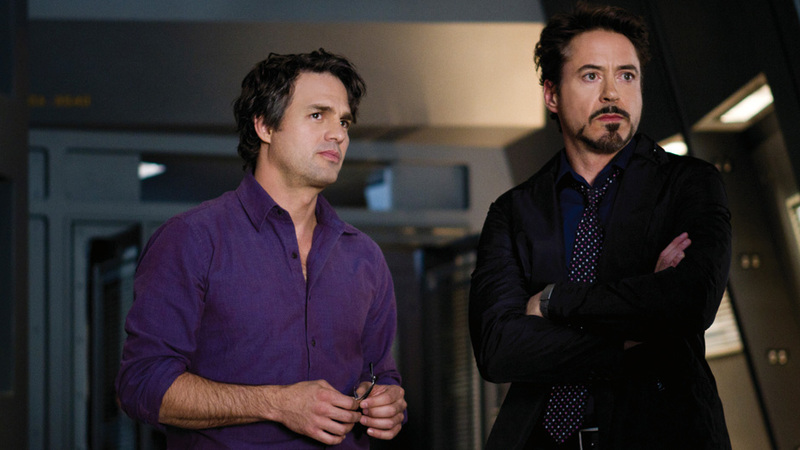 By being teamed up with Stark, Banner’s intellect is given a lot more precedence in (The) Avengers (Assemble). As a film that combines elements of four other Marvel movies, it’s unsurprising that Avengers combines elements of both previous Hulk films. As a character with a more rocky filmic history though, it is not unsurprising that only elements important to Banner’s own story are incorporated. While Iron Man, Captain America and Thor may have brought the plethora of supporting cast with them, and even the tessaract central to villain Loki’s plan, not even Betty Ross gets the courtesy mention afforded to Thor‘s Jane Foster, complete with Natalie Portman screenshot. As such it has to be said that even having been written and directed by Joss Whedon, whose previous film Serenity is a masterclass in exposition designed for both new and old audiences alike, any Hulk fan who hasn’t seen the others won’t exactly be confused throughout preceedings, but may be a little behind those who have. This time he is played by Mark Ruffalo, who was not only the original choice for Incredible, but who is also the first actor to portray the Hulk as well as his alter ego. Alongside a different actor, we also see a different side of the character; this time a Banner who is more paranoid, pointlessly turning away from a S.H.I.E.L.D. 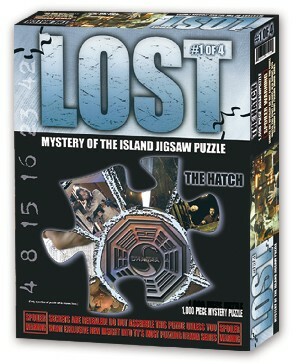 logo whilst in the middle of a command centre, and also has a more unique relationship with the Hulk, referring to him throughout as “the other guy”, even to the point of correcting himself when mentioning him by name. Added to this is his secret at controlling his changes. An idea that Whedon has since hinted at coming from his own experiences in Hollywood, Banner here is “always angry”, in comparison to Norton’s calming breathing techniques. As an ensemble piece we also get to see a variety of different reactions from the various characters. In the absence of Betty Ross, Scarlett Johansson’s Black Widow is at first wary of contacting “the big guy”, but brings a sense of pity as well as fear when trying to calm him. Perhaps the best though, outspoken as ever, is Robert Downey Jr’s Tony Stark. Not only is he a great match for Banner intellectually, but openly admits being a fan of both his “work on anti-electron collisions” as well as his ability to “turn into an enormous green rage monster”, which he considers to be Banner’s suiting up. Something Banner refutes however, clarifying that rather than having a suit, as the Hulk he is instead completely exposed. ‘The Incredible Hulk’ also set up another possible sequel with the origin of comic villain The Leader. Although not strictly an end to the Hulk story with The Avengers 2 is already in development and another stand alone film not completely out of the question, this appearance does bring a sense of conclusion to the character. Having fought the Hulk for so long, Banner is now more at peace with his alter-ego (even if he does have to always be angry to achieve it), and by fighting alongside the Avengers to save the earth, he has gained a sense of acceptance that was previously missing. So what are the connotations of three different actors? For a start, it is not as though Marvel films, even those considered canon to the Cinematic Universe, don’t have a perfect continuity record, with both Terrence Howard and Don Cheadle appearing as Captain Rhodes in the Iron Man films. With recent discussions about the logic behind how (un)generous the wages can be, it’s also entirely possible more changes may also take place in the future. As I’ve mentioned, we also witness three different sides to the character of Bruce Banner. Whilst film making is obviously a collaborative effort, especially when different films come from different writers and directors, throughout all the Hulk has been through I feel that I have to make a mention to Zak Penn, perhaps the only person to have been involved in the writing of all three films. While it would be unfair to blame him personally for the differences of the three films, his screenwriting history, especially with Marvel, is an interesting one. Credited as writing the story for both X2 and Avengers, arguably two of Marvels best efforts, he is also credited as writing (presumably the screenplay as well) Elektra and X-Men: The Last Stand, arguably not Marvel’s best efforts by any means. Actors, directors, and writers may change, and details may not be consistent throughout the three appearances of Bruce Banner and the Hulk, but we do get an over arching, if fractured, story which serves a great modern character. 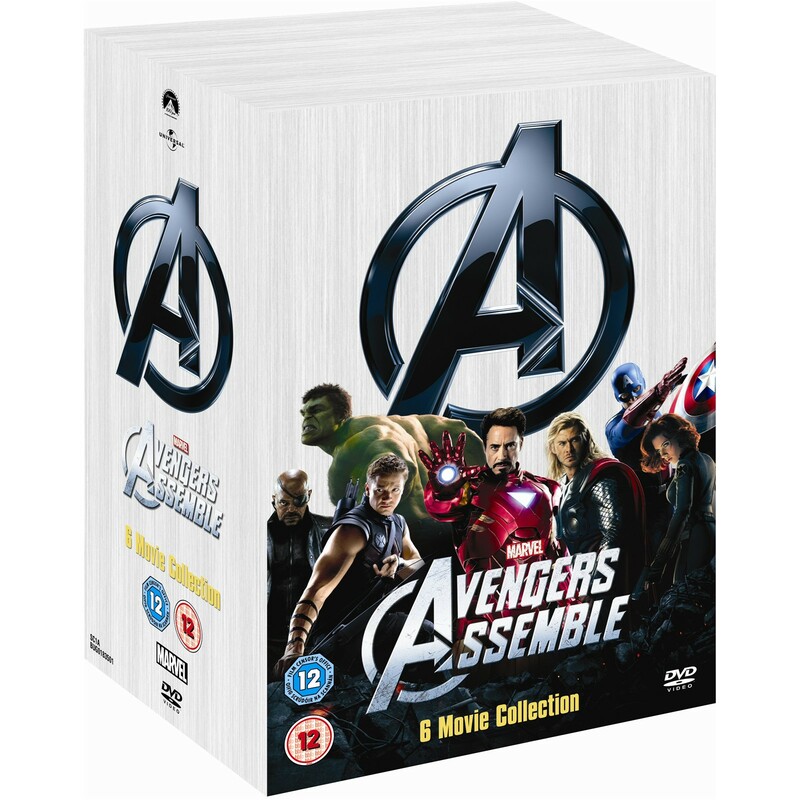 Overall, a great example of the many Marvel films that have been released recently, and why they are so popular. Whether they be a stand alone, sequel, or part of a franchise, Marvel Studios utilise well respected actors and terrific special effects, but these alone do not make successful films. Marvel films shine in exactly the same way its comics do, by telling enthralling stories about daring characters that have been thrilling audiences for generations.